Place mangos, honey, lemon juice and spices in a blender or food processor; puree until smooth. Score the surface of the ham in a diamond pattern with a sharp knife and place in a shallow baking dish. Brush with some of the mango glaze. Bake for 1 hour, basting with glaze frequently. 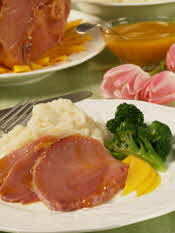 Slice ham and serve with any remaining glaze.